When you gaze at the Colorado Rocky Mountains, words might come to mind such as gorgeous, stunning, impressive, spectacular, or maybe majestic. There are 53 ranked peaks in the state that reach an elevation of more than 14,000 ft. above sea level known as 14ers. These famous mountains have been the obsession of outdoor enthusiasts who dream of standing on all of their summits. Profiles of these peaks range from steep and jagged to gentle and curved. Some have classic, iconic views from easily accessible tourist locations, but these very same mountains might be hard to recognize when seen from different or unique angles. Mt. Sneffels has to be at the top of the list. 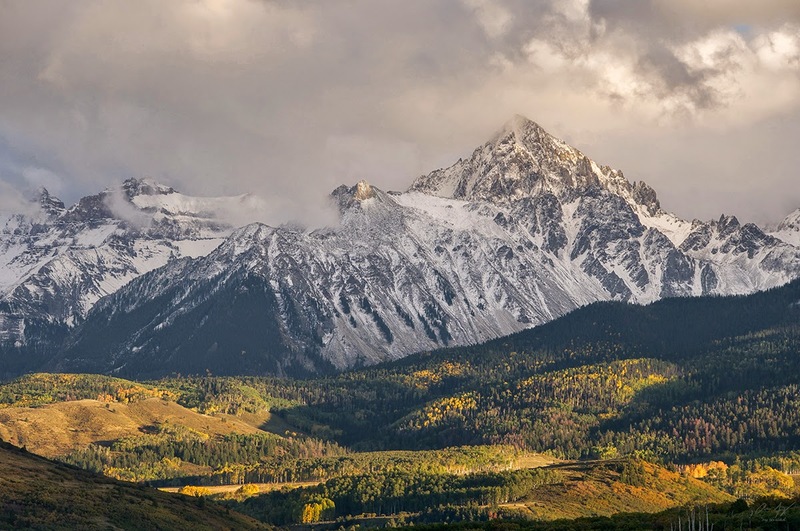 The Sneffels Range is unique from the rest of Colorado's mountains in appearance. 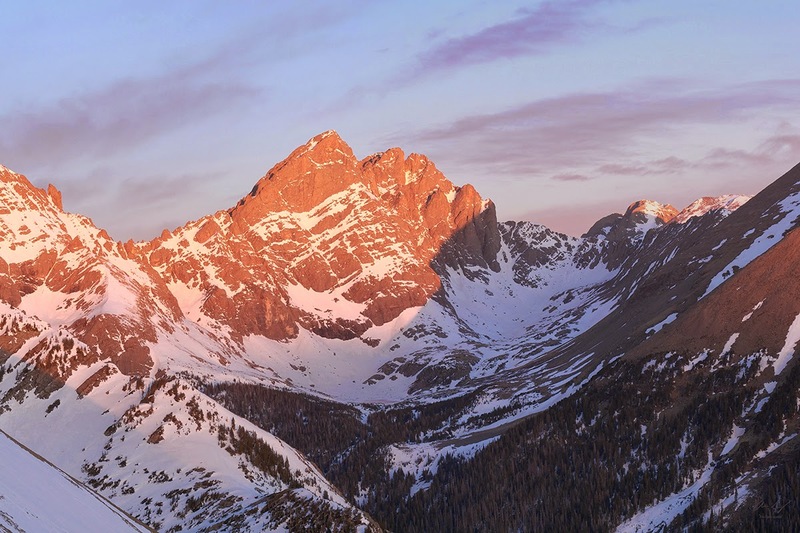 These rugged peaks rise drastically above the aspen forests and farm fields below. The panorama from Dallas Divide Pass on Hwy 62 west of Ridgway is one of the most magnificent sights that you can drive to in the state. From here, Mt. Sneffels has a traditional triangle mountain silhouette that looks like a mountain one of my 3rd grade students might draw. I could easily spend weeks at a time photographing this area during any season of the year. The Crestones are two connected summits located in the Sangre de Cristo Range near the town of Westcliffe. They belong to a long, thin chain of tall mountains that span from the south-central part of Colorado into northern New Mexico. They are included in the backdrop seen from the Great Sand Dunes National Park and the San Luis Valley. Jagged is one word I would use to describe these peaks. In my opinion, this duo is not only near the top of the "most beautiful" list, but also at the top of the "most fun to climb" list of 14ers. The Maroon Bells are probably the most photographed mountains in North America. The Tetons have the same claim, but I suppose there is no way to measure this statistic. Nevertheless, these two giants certainly live up to their fame. The classic postcard scene from Maroon Lake near the high-class town of Aspen contains every element that composes a great photograph: colorful hillsides of aspen groves, pristine lake reflections, and a perfect angle of view for the warm sunrise light to land on the snow-capped peaks. Just don't expect any solitude here. When I set up to take pictures of the autumn sunrise, there must have been more than 200 people lined up next to me along the shoreline tripod to tripod. Longs peak is the monarch of Rocky Mountain National Park. It is the most popular of the difficult peaks to climb due to its close proximity to Denver and other major Front Range cities. It has also claimed the most lives. There are dozens of routes to the summit ranging from basic scrambles to advanced 5th class technical climbing. During an ascent of Longs, you can't help but marvel at the sheer might of the east face known as the "Diamond". Other interesting natural features include the Keyhole, the Boulder Field, the Beaver, and the Ships Prow. There is a reason Coors Brewing Company chose to use Wilson Peak as a logo for its beer cans/commercials. 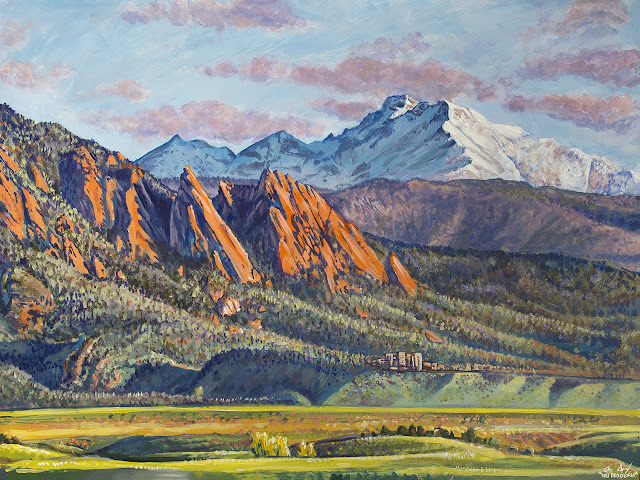 It is a perfect representation of the Colorado Rockies. This intimidating mountain dominates the view from the town of Telluride. Wilson Mesa and Silver Pick Road provide some of the finest perspectives of this peak. 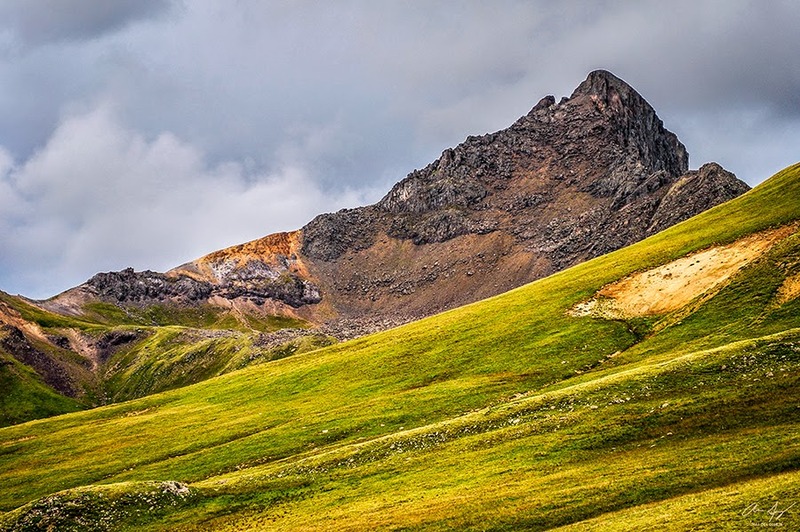 Wetterhorn is another San Juan beauty located in the Uncompahgre Wilderness near Lake City. 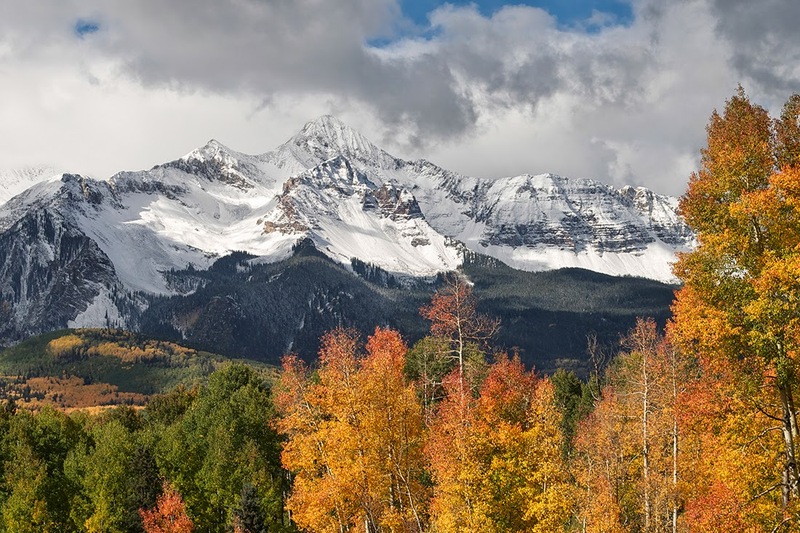 It is a neighbor to the taller, more popular Uncompahgre Peak. Wetterhorn is quite dramatic with sheer cliff walls falling off from near the summit. The landscape of the surrounding area consists of lush green tundra in the summer months which add to its beauty. This is one of those peaks that looks interesting and unique from all different aspects. Mt. Princeton is an awe inspiring Collegiate 14er located above the town of Buena Vista. 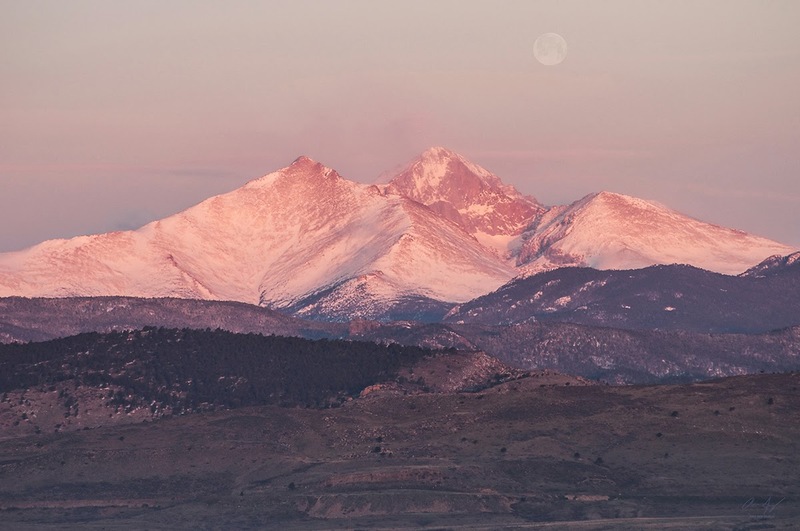 The Sawatch Range has the highest concentration of summits above 14,000 ft. compared to any other Colorado range. The Arkansas River Valley is not as popular as other mountain vacation destinations because of a lack of ski resorts and a longer distance from Denver. This makes it one of the best kept secrets for Coloradans who are into hiking, mountain biking, 4-wheeling, or whitewater rafting. I'm surprised that this area isn't more famous as the scenery is fantastic! This one is commonly known as the most difficult of the 14ers to climb. 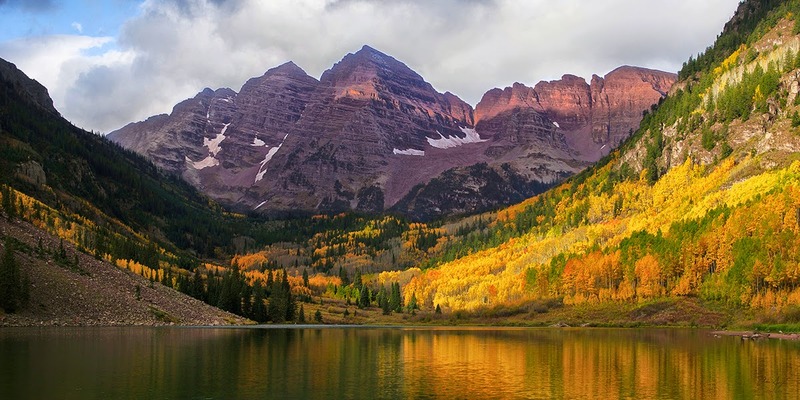 It is located in the Maroon Bells/Snowmass Wilderness of the Elk Range. In Autumn, the Capitol Creek Valley lights on fire with yellow hues from the endless hillsides of changing aspens while Capitol Peak looms in the distance as the centerpiece. It's quite a hike just to get to the base of this mountain. Most prefer to make it a multiple day trip to summit. Pikes Peak is somewhat mild in appearance when compared to others in the list. This is the only 14er that you can drive all the way to the summit in your car (Mt. Evans comes close and can be driven almost to the summit). You can also get a train ticket to the top! Pikes Peak stands out on its own away from other peaks and is nearly visible from the Wyoming border to the north and New Mexico to the south. The mountain is famous and inspired the song "America the Beautiful" shortly after Katharine Lee Bates stood on the summit. One of the most fascinating places to photograph Pikes is from Garden of the Gods Park in Colorado Springs. From this location, you can see huge rolling hills filled with large craggy rock formations giving way to its broad, massive summit. Like the Bells, you will not be lonely here on a summer weekend. Windom Peak and the other Needle Mountain 14ers are among the most secluded. The easiest way to access them requires a ticket on the Durango/Silverton Narrow Gauge Railroad Train and a 6 mile backpack with 3,000 ft. of elevation gain to reach base camp. The area is surrounded by jagged, pointed rock spires with unlimited rock climbing opportunities. Windom is the second (or first depending on the most recent surveys) tallest of the group. The views of Windom Peak, Jupiter Mountain and Peak 18 from the Chicago Basin are absolutely breathtaking! So what do you think? Did I miss any? There are definitely other peaks that compare to these. Maybe I should make it a top 20 list. Or top 30. One thing is sure. No matter where you choose to go in the mountains, you will find beauty there. Absolutely beautiful shots. You captured the majesty and the beauty of Colorado's 14ers! Great collection. I have lived in Denver for over 5 years and I have only done few of those 14ers. Thanks for the fun article. I agree Stan...Holy Cross and Blanca should be in there too. It's a difficult list to make for sure. I tend to want to include the ones I've seen most recently. If only I could capture landscapes this well! Amazing work Aaron. Definitely Agree with Sneffels at #1. Might disagree with the ordering of others, but that's a nitpick. I do think Blanca/Little Bear probably ought to make the list.